I believe I got this recipe from my sister Janeen. Pre-heat oven to 350. 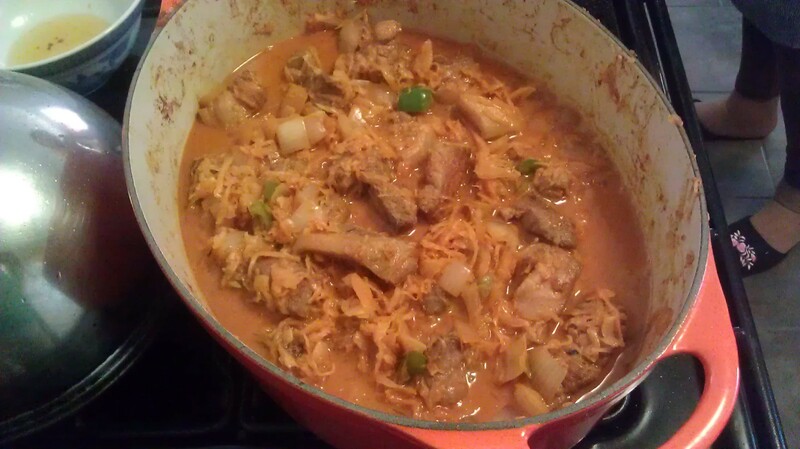 In sauce pan on stove melt butter, add flour, garlic, shallots, rosemary, pepper, stock, salt, cream but do NOT boil. Add the first half of the cheese. Layer potatoes in a greased baking dish. Pour mixture over the potatoes, sprinkle second portion of Gruyere on top. Bake for an hour and 30 minutes or until golden brown in places and the potatoes are done when tested with a fork. 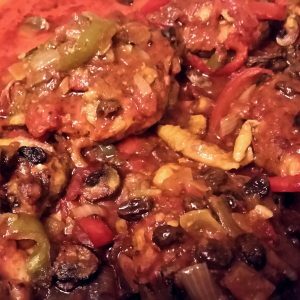 This recipe was shared with me by my Mom, Ann Barczay Sloan. Preheat oven to 350. Brown the pork in bacon grease, salt and pepper the meat then add in onions and bell peppers until onions are translucent. Add garlic and stir that until it is cooked. Add paprika to cover/color meat, its an eyeball thing. Truth be told its hard to add too much paprika. Add caraway seeds and bay leaves then add the sauerkraut. Bring to a low boil, cover it and cook for 5 minutes. Move to oven for 40 minutes. 10 minutes before the time is up stir in the sour cream. Serve with boiled potatoes. The filling portion has actually been pulled OUT of the pepper here. 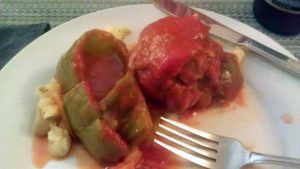 My Mom, Ann Barczay Sloan, shared this recipe with me. Pre-heat oven to 350 degrees. Mix the ground beef, pepper, salt, paprika, garlic powder, cooked rice and 3 tblsp. of tomato sauce in a mixing bowl. Cut the tops off of the pepper and clean out seeds and extra veins of white material to maximize the available room for stuffing. Stuff all of your peppers and place in a baking dish. 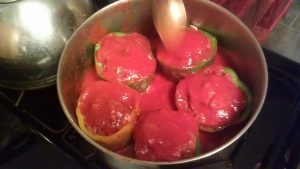 In a sauce pan on the stove pour remaining tomato sauce, sugar and paprika and heat until very hot/steaming and then ladle or pour over the peppers carefully so that they are uniformly covered/coated. 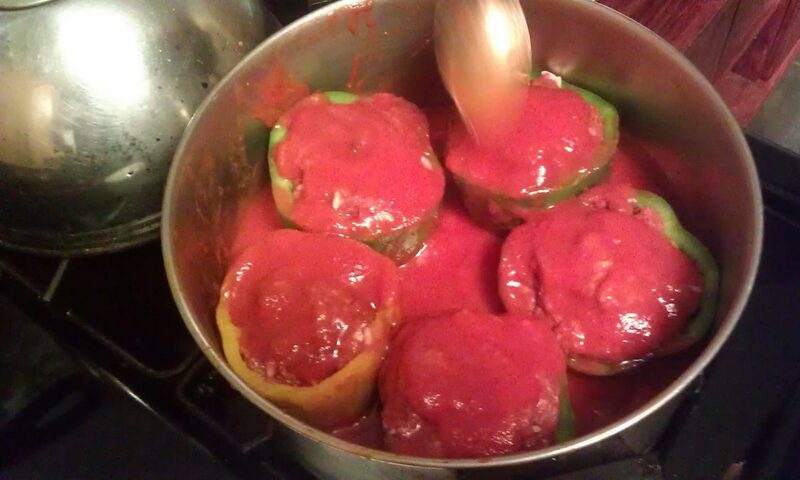 About 15 minutes into the 30 minutes cooking time you can open the oven and baste the peppers using the sauce (see photo below) that’s forming around them. Actually you could baste as many times as you’d like and they’ll probably be even more delicious. These are done when the peppers are soft but still hold together. NOTES: this can be served with boiled potatoes, the sauce goes great with them. I struggled for a name for this dish and settled on this as the most accurate. It mixes European (Italian, Hungarian) and North African (Tunisian) flavors. It’s easy to make and really reheats well. Pre-heat oven to 425 degrees. I have a large ceramic coated metal roasting pan that’s shallow. On the stovetop I add the oil oil and then brown the chicken on a low flame because I want to get them nicely cooked before I put them in the oven. After you’ve flipped and browned the 2nd side of the chicken start adding the vegetables, you might boost the flame a little. I go onions, then bell peppers, then garlic, the raisins, then balsamic vinegar, then tomato sauce, then harissa. The mushrooms I stir in right before moving the dish to the oven for 20 – 25 minutes to finish it off. 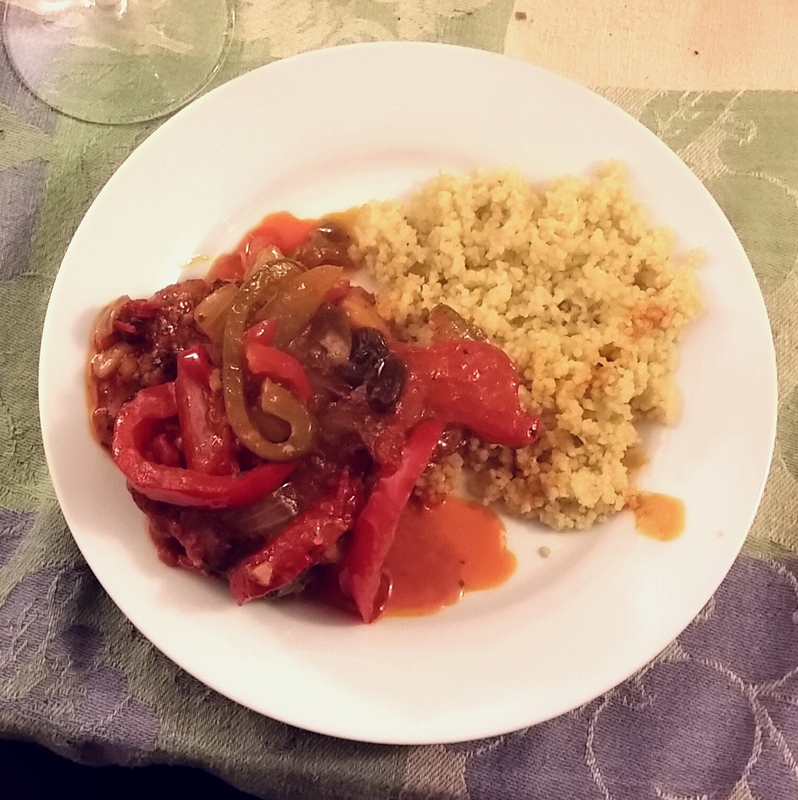 I served mine with pine nut couscous but it would go great with linguini or other pasta. Notes: you could easily add more garlic! Tastes even better the next day, reheats well in the microwave. Mediterranean chicken up close in the pan after coming out of the oven.